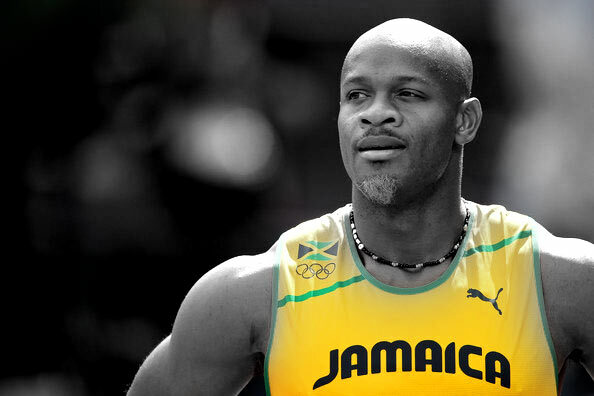 Asafa Powell CD (born 23 November 1982) in Linstead, St. Catherine (Jamaica) is a sprinter who specializes in the 100 metres. Originally Powell had his sights on being a mechanic while studying at Charlemont High School. However in 2000 after representing Charlemont at the ISSA High School Championships though he didn’t progress past the 1st round his desire to run was firmly planted on the track. In 2001 he returned to the ISSA High School Championships and not only did his times get better but he made it to the finals & was the favorite to win, he was spotted by Coach Stephen Francis who offered to train him and there the story of the Jamaican Sprint legacy began. In 2002 Powell represented Jamaica at the Commonwealth Games in Manchester, UK. He made the semi finals of the 100m finishing 5th in his race with a personal best of 10.26 seconds. At the same games as part of the Jamaican 4 x 100m sprint relay team he came home with the silver medal. 2003 saw him competing in his first World Championships but he ended up being disqualified for a false start in the quarter finals. In 2004 he neared closer to making history when he went to the Athens Olympics as one of the favourites after running a 9.91 seconds in the Jamaican National Championships. After qualifying for the final easily he placed 5th with a time of 9.94 seconds, However later that year he set a new personal best of 9.87 in Brussels. He went back to Athens where so much had been expected of him the year before and set his first World Record with a time of 9.77 seconds. Powell held the 100 m world record between June 2005 and May 2008, with times of 9.77 and 9.74 seconds respectively. He has consistently broken the 10-second barrier in competition, with his personal best of 9.72 s being the fifth fastest time in the history of the event. As of August 5,2012, Powell has broken the ten-second barrier legally more times than anyone else – 80 times.Powell competed in the 100 m at the 2004, 2008 and 2012 Olympics, finishing fifth in 2004 and 2008 and eighth after injuring his groin during the race in 2012. In 2008 he won a gold medal and set the world and Olympic records as part of the Jamaican 4 × 100 metres relay team in Beijing. At the 2007 Osaka World Championships he won a bronze and a silver medal in the 100 m and 4 x 100 m relay respectively and he has been successful at the 2006 Commonwealth Games, winning two gold in Melbourne, AU and one silver medal in Manchester, UK. At the 2009 World Championships in Berlin, GER he won 100 m bronze and a relay gold. Powell has won five times at the IAAF World Athletics Final and is the 100 m record holder for the event. Powell was voted IAAF’s Male Athlete of the year in 2006.